Geology Vocabulary Bundle! 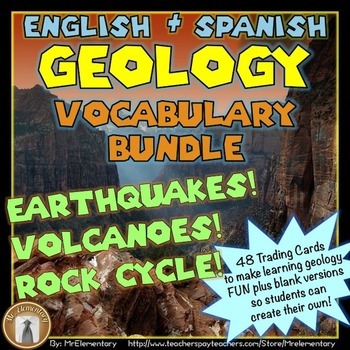 This geology vocabulary bundle includes my volcano, earthquake and rock cycle vocabulary cards bundled together 30% off their individual prices. I make my vocabulary cards look like trading cards so they’re more engaging to students. I created them to be used as flash cards or task cards and my students LOVE to use them! 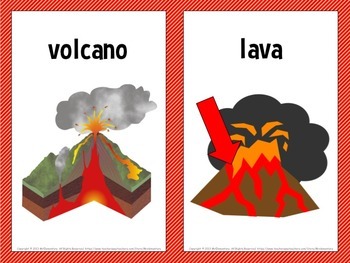 •	The same 16 volcano cards that can be used as task cards with the words on them but blank spaces for students to draw their own picture room to write their own definitions and sentences. •	8 blank task cards that students can use to add more geology/volcano terms to as they come across them in their studies. •	An enlarged version of each card for a volcano word wall or bulletin board. Two cards fit on a 8.5" x 11" sheet of paper. 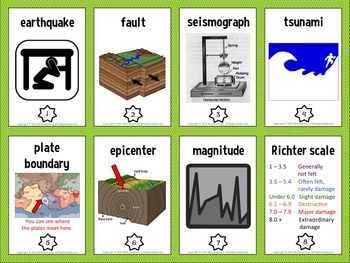 •	The same 16 earthquake cards that can be used as task cards with the words on them but blank spaces for students to draw their own picture room to write their own definitions and sentences. •	8 blank task cards that students can use to add more geology/ earthquake terms to as they come across them in their studies. •	An enlarged version of each card for an earthquake word wall or bulletin board. Two cards fit on a 8.5" x 11" sheet of paper. •	16 rock cycle trading cards with the word and picture on the front and a definition and sentence on the back. 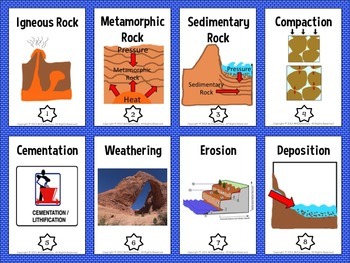 •	The same 16 rock cycle cards that can be used as task cards with the words on them but blank spaces for students to draw their own picture room to write their own definitions and sentences. •	8 blank task cards that students can use to add more geology/rock cycle terms to as they come across them in their studies. •	A template for a labeled box that students can cut out, write their name on and color to store their rock cycle cards in. •	An enlarged version of each card for a rock cycle word wall or bulletin board. Two cards fit on a 8.5" x 11" sheet of paper. This Geology Bundle comes with a list of ways you can use these geology vocabulary flashcards/trading cards with your students that is based on Robert Marzano’s “Six Steps to Better Vocabulary Instruction”. This list helps me because I can show parents, administrators, other teachers, etc. that I’m using research-based methods in my classroom. Also included for free is my Trading Card Manual: 15 pages of tips and ideas on how to use these trading cards in your class. I print these geology cards out double sided on card stock so they look and feel like real trading cards but they work just as well on regular paper. The front of each card has the word and a picture. The back has a definition and a sentence. Thanks for looking at this Geology Vocabulary Bundle and be sure to check out the other fun vocabulary cards and games in my store! Geology Vocabulary Bundle is licensed under a Creative Commons Attribution-NonCommercial-NoDerivs 3.0 Unported License.